What's your LEGO collection OCD? My OCD is much worse! All the little 'Lego' writing on top of the studs of all bricks need to be placed, as much as possible, facing in the same direction whenever I build something. It sometimes drives me mad! ^Yes I do the same, flicking through the pages of the instruction manual to see how the section adds up to the model so I know how to connect all bricks with the logo facing the same way, even the ones that are hidden. The logo's on all the round one stud plates also need to be aligned. I am trying to let go of this OCD, but often I just can't. All this makes me sometimes take forever to finish building a set. I know I do not always have this fixation to the extend I have it now. This is also why stickers can totally freak me out, they need to be applied exactly right, and when I fail to do so, I am so annoyed with myself. I have not MOC'ed anything in a while, but when I do, somehow I am not bothered by it that much. Hi, my name is Klatu003 and I am slovenly builder. All the LEGO printing on my bricks end up facing any which way. After some sticker moments of woe (it never helps to remove and reapply), I've learned to just do the best I can and move on. I think I would have to agree. Aligning the studs is going to extremes! My OCD is somewhat higher-level (and I realise not actual OCD). I'm on @klatu003 's team! Slovenly Builders rule the world team. We just love throwing those dang bricks together any way we can without the crapping model falling on the floor. I often wonder how we managed to get so many sets put together in so many wrong ways. Hubby ALWAYS blames LEGO for not including all the parts, and then rebuilds it about five times before figuring out that the "Missing Parts" were hiding in the wrong place of the build. It is so much fun building things wrong and seeing if they somewhat resemble the picture on the front of the booklet. The only set we slaved over was the Taj Mahal because it has so many $#^*(^%# little pieces and our son was home from college that week and read all the fine print and made us follow the directions for once. And your vision does quickly go downhill as you advance in years, so forget about putting anything together perfectly....at least you can no longer clearly see that it is not put together perfectly after a while. It must be excruciating to collect and build LEGO if one is OCD. Thanks, I somehow missed getting that gene. If I did have OCD, I would find another hobby like water or snow skiing where you can't control the course. I have a different kind of OCD. I like to sort my Lego by colour, size, printed bricks, MF tools/weapons, MF body parts etc etc. I have lots of containers "getting in the way" and "taking up space". I also like to put all the transparent bits into a bag and look at them and, I really like the little jewel and crystal shaped elements. I have quite a few and they have been shared out into my stash of treasure chests. 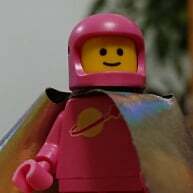 I also have a thing for Lego elements which can be a deciding factor when purchasing sets. I recently bought a small Lone Ranger set just for the horse, printed flag, cannon and (most importantly) a frying pan with a chicken leg to go in it. When I buy any second hand Lego there is often a yelp of joy because there is some element in the batch that is missing from my hoard. Stickers. Trying to get them perfectly centered (or where ever the instructions tell me to) on the brick. Wow, I never heard of having to align all the logos in the right way. I feel for you. Must be very hard. I tried to be light hearted about most things but steak is have to be right my husband go telling off yesterday because he did a see-through one for my sons set and managed to get a little bit of fluff from his dressing gown in there. you can hardly see it but I was still annoyed so now I do all the stickers again. I have taken issue with misaligned stickers for as long as I can remember - it predates Lego by far. A misplaced sticker is a mental splinter that I cannot remove. The imperfection continually gnaws at my brain to the point that I would just assume throw the eye sore away then continue to look at it. It's even worse when I'm the one who messed the sticker up. When end I was a kid I would save the stickers to my GI Joe sets until I visited my Uncle. He was excellent at applying them and I knew he would always do the best possible job. I wasn't lazy, but couldn't stand the thought of messing up one of my prized processions. As far as Lego is concerned today - stickers don't happen. I won't apply them. I don't really have any other LEGO OCD tendencies, but I do this too. I don't bother with it on sets I build with/for the kids, but my collection is "LEGO logo aligned". I just think it makes the builds look better up close. It is literally impossible to get all of the logos to face the same way. I think you missed the bit about "as much as possible". My only real OCD problems concerns my sets, I don't worry about the boxes as I really don't have the room to store them but my sets must remain sets. When I take a build down, all the parts are placed in Tupperware type containers and sealed with the instructions (if size allows). I honestly didn't think I had an issue until I brought 2 of the same set so I could he one for parts then couldn't bring myself to do it. So now have 2 of the same set sealed in plastic containers with their instructions. It's also why I use brick link, brick owl and PAB so much. For me, all stickers must be perfect. Absolutely, 100% perfect. Other than that, all minifigs who are't in a vehicle must be on a CMF stand in front of the vehicle. All Star Wars sets are either order by type (Repub. Ground, Air), planet (Tatooine), UCS, or movie (Ep. I). -All sets must be built as shown in the box art picture. -All stickers must be applied, with an extra sticker sheet purchased as a spare. -All Superhero figs are divided between Comic and Movie/TV Universes. -All Star Wars figs are divided first by era: Yellow, Flesh & Color. Then subthemed by Episode I-VII, with Clone Wars, Extended Universe, Promos separate. Superheroes must be separated DC/Marvel, and then Batman, general DC, Avengers and general Marvel. I don't know that it constitutes OCD, but I have my quirks. Bricks with those little marks which, I believe, come from the injection moulding (round 1x1, for instance, or those technic double-ended connectors, or 2x2 flat panels which have them on one side) I try to orient so that the mark is facing away from whichever direction will be the front when I put it on the shelf, or (better) is concealed by an adjacent brick, if there is one. I did spend quite a while lining up all the round 1x1s in the Death Star playset's superlaser central beam. Similarly, pieces like the 4x1 flat panel have a visible circular imperfection in the flat top at one end of them; I try to line them up whichever way makes it seem like it's part of the design (all facing the same way, or oriented according to what's adjacent to the piece, and so on). I do try to maintain some sort of order on my shelves, according to theme, character allegiance, and so on, but that's a constant tug-of-war between headcanon, how much shelf space I've got available, and whether there are enough sets in a theme to fill one. The Avengers/Marvel New York, Justice League/Batcave, Tatooine, Hoth, Endor/Home One, and Agents/Ultra Agents are all reasonably distinct; for the rest I just kind of wing it. I do the Lego-logo facing all the same way too (or as much as possible). I'm also in the camp of keeping sets together as sets, and having separate bricks for MOCS. However, I'll steal parts from sets if need be for a MOC, make note of the parts that go in, and then when I take the MOC down I distribute the parts back to their sets. Strangely, I used to do this even as a child. I read a lot about how people like to keep sets as sets. What does this mean exactly? So only building and displaying the pieces that come with a particular set? What about sets of the same thing? Say I buy the whole deep sea explorer line - if I wanted to load all the divers up on the deep sea vessel does this mess things up? As of now, that's kind of how I am. I don't like to mix ANYTHING. It all stays separate - set by set, so just curious where others are coming from. My collection OCD relates to storing it. Lego is for mixing and mashing, so I part out every set into the collection. But the pieces are carefully stored so that they're easy to find. I have only one set that I don't mix up, the original Millennium Falcon, because my wife bought it on ebay for an exorbitant sum. However, my OCD also prevents me from giving away or selling parts. The sets are all mixed together, but it must remain possible for me to extract them all, as if they'd never been mixed. If my 5-year-old son has his way, that will be happening soon, as he is going through my instruction books and rebuilding everything that's "cool". I have OCD big time and as a father of a 2 and 3 year old whom I share my Legos with (the stuff I build, God forbid they ever get their hands on my sealed stuff...) it's a big issue. Obviously I can't sort the Legos the way I would like because they would ruin it in a pair of seconds. But one OCD rule that I enforce in our household with an iron fist is: No non-Legos on the Lego table! When I find a non-Lego toy on our Lego table I'll call them in and simply point to the table. They will instantly find the offending toy and say, "IT'S NOT A LEGO!!!!" and quickly move it somewhere else. I've trained them well! They will instantly find the offending toy and say, "IT'S NOT A LEGO!!!!" and quickly move it somewhere else. I've trained them well! Being in control of your collection, bricks and collection is a very natural reaction. I ended up doing some research on why and how collectors deal with their precious possessions. The topic is rather deep and I ended up writing a little book about it. Maybe you would enjoy it. It is called "The Ideal Order". 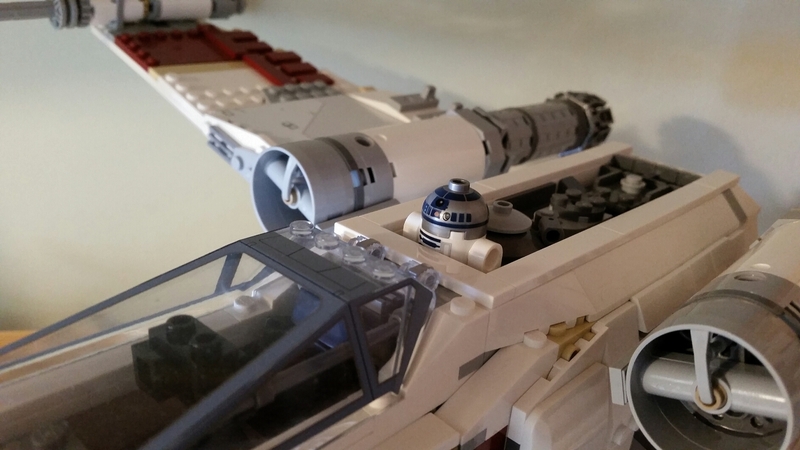 Despite the latest R2-D2 having far superior printing, I just can't bring myself to have a non-standard R2 sitting on top of #10240. ^ I'm right with you on that. 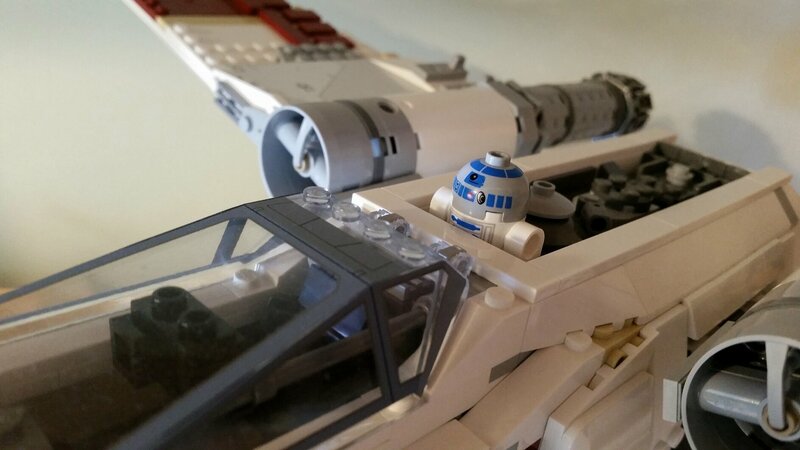 If it were an X-Wing MOC, I'd go with the new R2 all day. But since it's an actual set, I'd stick with the one that came with it. My almost 6 year old does want to the stickers himself - I just tell myself it really doesn't matter. Though since I also "love to do stickers" I insist on doing them for the "family" sets. I was so happy when we opened the Detective's Office and there were no stickers. My good friend gave him the City Square for Christmas and helped him build a lot of it and the stickers are all at least slightly crooked and have hair/crumbs/who knows what under them - it makes me cringe. I really want to get another sticker sheet and re-do them all. @xwingpilot The real OCD that got me in that set were the windscreen stickers. As if the stress of applying normal stickers was not bad enough, now you have to worry about air bubbles and miss alignment as there is close to no margin of error. I'm not sure why it's taken me so long to post photos of these, but here's how I'm currently displaying minifigures and microfighters on my display shelves. at least youare not totally OCD, the "Lego" on the studs don't all point in the same direction. @bandit778 Nah, he's all about symmetry. Like many of you, the Minifigs that come with sets must be on a CMF stand, in front of the displayed set! I also don't mix themes on a single shelf! ^ I only display minifigs separately if they don't have an appropriate location in the set. So, for example, the entire crew of #75094 are displayed inside the shuttle. Like many I must have the stickers 1,000,000,000% correct. All my minifigures are very organized and when possible I try to get the "Lego" facing the same way. They all must be completely complete. Probably my favourite thread on here. Makes me feel like I have a safe Lego home without judgement.